Content curation is one way to find and share useful knowledge efficiently. There are plenty of user friendly push-button digital tools to help you collect, organize and store web content in flexible ways to allow for shared resources that are accessible online. Educators can use content curation tools to streamline instruction by providing students with easy online access to a variety of resources to meet the needs of diverse learners. Use handy bookmarklet tools to quickly create collections of content-related resources for students, parents or coworkers. Embed collections of resources into a webpage, blog or wiki for easy access. Create packages of content for student research, inquiry and project-based learning. Design guided-learning activities that include digital text at a variety of reading levels and multimedia resources to meet the diverse learning needs of all students. Create collections of published student work that are easily available for sharing and reflection. I created a collection of Cool Tools to Curate Content using Mentor Mob, one of the featured tools. Use it to quickly browse through the tools that interest you and enjoy the opportunity to interact with live webpages right within the playlist. Consider how you can use Mentor Mob or one of the featured tools to create a collection of resources for your own use. Great post Susan! 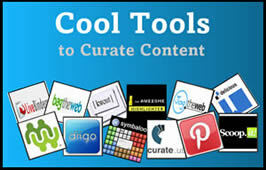 There is so much content out there and now there are so many curation tools to choose from. Very helpful playlist.